Earlier this week Sony went live with Xperia ZL pre-orders. 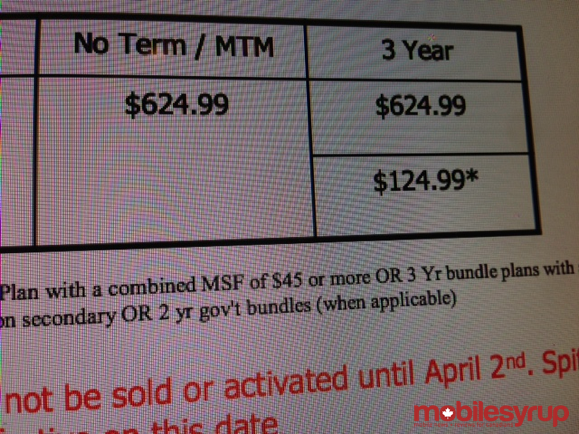 The cost of owning this locked to Rogers is $674.99 with an “Estimated ship date: 04/02/2013.” Well, according to an internal doc we received it confirms the April 2nd launch date, but also reveals the go-to-market pricing. If you’re interested in scoring this 5-inch Android-powered device (runs OS 4.1) then you’ll be happy to know the price is $50 cheaper directly from Rogers, coming in at $624.99 outright. In addition, the 3-year contract price point is $124.99. Have a look at our quick hands-on of the Xperia ZL here.